Water damage can be devastating to property owners. Whether it’s a leak that builds up over time or a flooded basement in Vancouver the impact can be far-reaching. Water damage harms appliances, furniture, and even causes structural damage in large amounts. When facing a need for emergency restoration, you need professionals that deliver fast comprehensive restoration services. At 911 Restoration, our techs are IICRC-certified to handle every emergency from water damage and mold contamination to fire damage and disaster restoration. 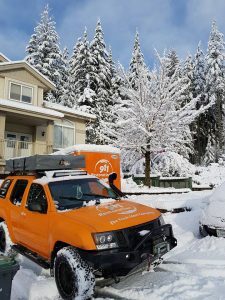 No matter what kind of damage your property suffers, you can count on 911 Restoration of Vancouver to handle your emergency restoration needs. Call today to get your guaranteed Fresh Start. As soon as we arrive you can count on us to get to work on your water damage restoration immediately. After stopping the source of the water damage and finishing our visual inspection, we get to work on fixing your water damage. We believe in providing a full and comprehensive service for your water damage restoration. That’s why we make sure to provide the following services every single time. In addition to our physical services, we also provide our expertise with insurance companies to help ensure you have a successful insurance claim the first time. If you deem it necessary, we will even file your insurance claim on your behalf. Water damage is difficult enough to deal with. Dealing with the paperwork shouldn’t be as well. We use nothing but the latest water extraction equipment and commercial dryers to ensure that your property is completely dried out. By approaching your water damage this way, we proactively work to prevent the possibility of a mold infestation. 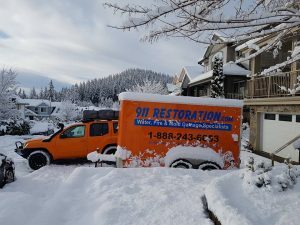 If you are suffering from water damage, don’t wait to call 911 Restoration of Vancouver to take care of your water damage restoration needs. We will be there within 45 minutes of your call to deliver a Fresh Start. When winter hits in full force, your property can be at risk without you even knowing it. As temperatures drop, one common problem owners face is frozen pipes. Frozen pipes prevent the water within from flowing properly causing a buildup of pressure. This translates to a burst pipe. Once your pipes have burst, you are likely looking at a flooded basement since many pipes are located in that area of the house. The key to managing your flooded basement is getting water damage restoration specialists to the scene as fast as possible. Once we have verified that the burst pipe is secured, we begin working on your flood cleanup to get your property dried out. The longer the water has to pool, the greater the risk of creating secondary problems like mold or a sewage backup. Don’t wait when facing a flooded basement or frozen pipes. Call 911 Restoration and we’ll be there to handle your winter restoration so you are back to normal as quickly as possible. One of the most hazardous forms of property damage is the kind that stems from a sewage backup. Your septic system can be at risk of overflowing through pressure buildup within the city’s sewer system or through the pipes being frozen. When this occurs, you need professionals to handle your sewage cleanup. Sewage carries a lot of filth and excrement that can cause tremendous harm to your home and to your health. This waste matter is classified as a class three material, which means direct contact is harmful to a person’s health. That’s why our certified professionals wear hazmat suits while handling your sewage cleanup. In addition to doing repairs on your damaged plumbing system, we also will work to decontaminate your home by using industrial strength cleaning solutions that will kill bacteria without causing more damage to wood or textiles. After decontamination, we use our water extraction techniques to dry out your property completely. Prompt action is the key to a successful sewage cleanup. Call us immediately if you’re suffering from a sewage backup. We’ll be there within 45 minutes of your call to deliver a Fresh Start you can count on. Our fire damage restoration techs remove smoke stains, extract standing water, and replace all damage. We believe that you deserve only the best in home repair. Fire damage restoration is more than just removing the ash and smoke odor from a property. We are standing by ready to assist you with your fire damage restoration. If you have suffered fire damage, don’t wait to call 911 Restoration. We’ll take care of everything from smoke removal to water damage restoration to deliver a Fresh Start. Disasters cause large amounts of damage to your property. Whether it’s a storm, fire, or flood the end result is the need for disaster restoration. Our certified specialists are further trained to handle all disaster restorations delivering a service you can count on. We have you covered no matter if you’re faced with water damage, mold growth, sewage backup, fire damage, or disaster damage. We have the solutions, so give us a call immediately to start benefitting. With us, your property will be better than new before you know it. One of the problems that can arise as a direct result of water damage is mold growth. When a leak occurs within your home, it creates a moist environment where mold can start to grow and thrive. Mold only needs 24 hours to start growing and causing damage to your property. Mold hastens the deterioration of wooden sections of your home and the spores that it releases can trigger respiratory conditions like coughing and asthma. This is why mold removal specialists are needed to restore your property to good as new when mold is discovered. If you suspect mold, call the mold removal specialists at 911 Restoration of Vancouver. We’ll not only take care of your mold removal but also the water restoration so that mold cannot come back. Call today for a Fresh Start.